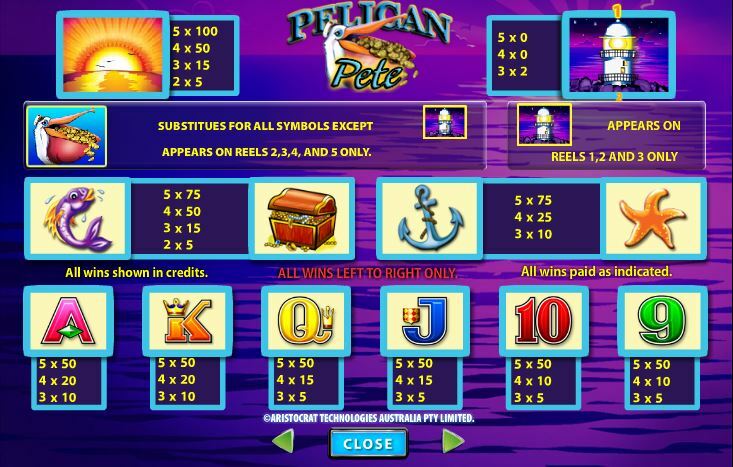 Pelican Pete is an Aristocrat designed slot machine, a title where the main character is a pelican called Pete obviously, but also a game designed around a marine theme. Pete seems to be a sailor, but the developers haven’t ignored the treasure theme either, so his beak is full of gold coins. The game’s design is simple enough, but Pelican Pete is an interesting character. You will receive plenty of chances to get paid each round in Pelican Pete, as its 5 reels can host up to 50 paylines that are active. 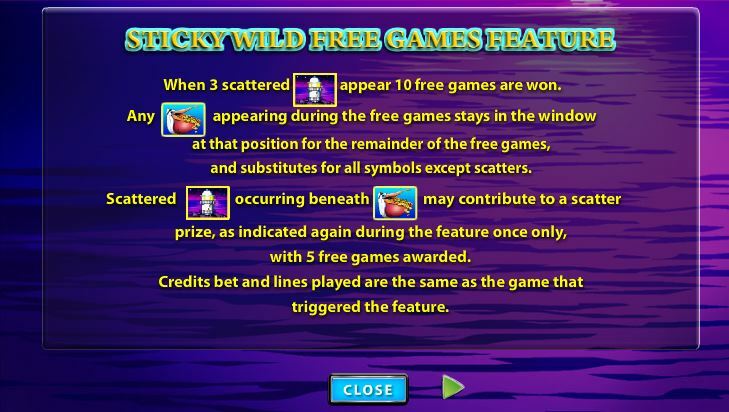 Among its features, you will get scatter symbols, free spins with sticky wilds and regular ones for the base game. The slot’s biggest rewards will only give you $1,000. 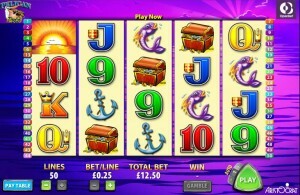 The three types of features that Pelican Pete offers include the wild, the scatter and the free games. You can see Pelican Pete in one of the symbols, and it’s the one that also has the power to act as a wild. This means that it is capable of replacing a regular symbol in a combo, though it first needs to appear where it’s needed, on the right line and in the right position on it. These wilds are reserved for the 2nd, 3rd, 4th and 5th reels. With only four reels getting these symbols, they’re not going to be able to pay you anything when they’re on the same line together. The Lighthouse symbol is the other one that has an extra role, acting as the scatter and triggering free spins. You will get it on the 1st, 3rd and 5th reels. The three scattered Lighthouse icons are required to be present during the same round, before you’re offered 10 free spins. Their main advantage is the presence of sticky wilds. 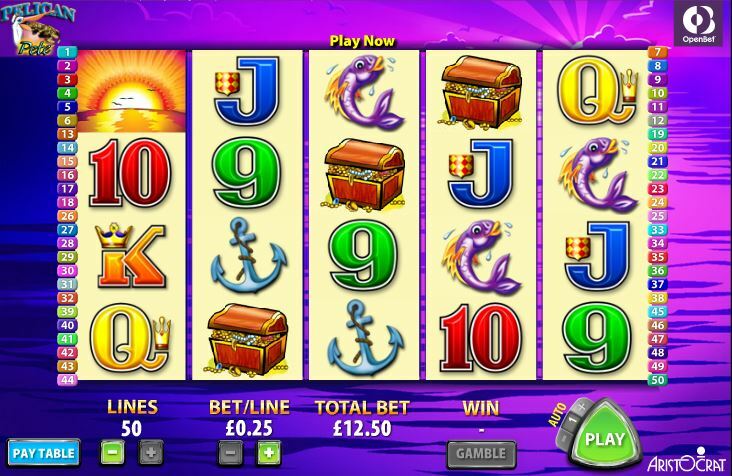 Whenever one wild appears, it will stay in place for as long as you have free spins. Getting Lighthouse scatters underneath a Pelican Pete symbol may trigger 5 additional free spins. You can choose the number of active lines, between 1 and 50, plus you can decide what the denomination should be for each coin that is used. Each line gets only one coin, whose value is between $0.25 and $10. The game has high wagering requirements if you want to max out the bet, going as high as $500. While the wager can get up to $500, the biggest rewards are not as impressive, only going up to $1,000. You get 100 coins from the best possible combo, which is formed by five Sunset icons. The marine theme of Pelican Pete is visible in many of its symbols and in the background picture. The latter will show you the ocean, an image at sunset, where the water gets a blue and purple color. On the reels, the symbols do give you those predictable poker cards, but they also include Pelican Pete, anchors, treasure chests, fish and lighthouses. The quality of the design is hardly impressive, not quite as good as it should’ve been since it’s a recently released slot. Symbols: Sunset (100 coins), Lighthouse (scatter, 2x the bet), Pelican Pete (wild), Fish (75 coins), Treasure Chest (75 coins), Anchor (75 coins), Starfish (75 coins), Ace (50 coins), King (50 coins), Queen (50 coins), Jack (50 coins), 10 (50 coins) and 9 (50 coins). The main character, Pelican Pete, is a fun addition to the slot, and the features aren’t too bad, but the top jackpot of 100x looks more like a joke, especially since the wagers need to get very high in order to get it. 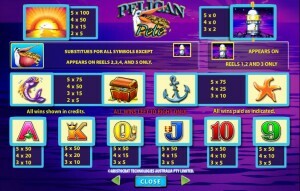 This Pelican Pete slot is offered by all online casinos with Aristocrat software, playable either in practice or in real money mode.